Celebrate the spectacular days of summer fun with the Phineas & Ferb gang and bring that fun-loving spirit right to your walls with these fun and interactive Phineas & Ferb wall decals. Your favorite characters are here... Phineas, Ferb, Agent P, Dr. Doofenshmirtz, Candace, Jeremy, and Isabella... along with lots of colorful coordinating pieces, all ready to transform the look of your room in just minutes. 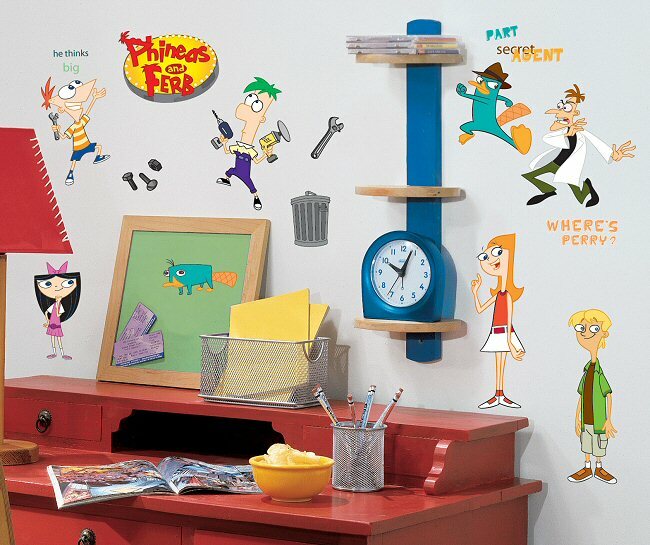 Our RoomMates Phineas & Ferb wall decals (also known as wall stickers or wall appliques) are repositionable, removable, re-usable, and washable... a parent's dream combination for kids' wall decorations. Whether you are transforming bedroom, playroom, or even classroom walls, our peel and stick Phineas & Ferb wall stickers offer decorating ease with no damage or residue to the surface when removed. Approx. .75" x 1.5" (pink cell phone) to 10.5" x 5.25" (truck); Phineas 5.5" x 7.5"; Ferb 3" x 9.25"; Agent P w/Parachute 9.25" x 5.375"